Catch the Buzz on Bees at the Philadelphia Honey Festival! The fourth annual Philadelphia Honey Festival is coming back to town! 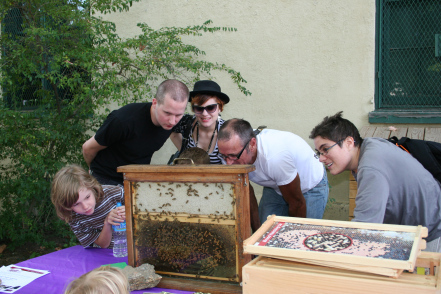 This September 6-8, The Philadelphia Beekeepers Guild presents the totally free educational festival will be featuring events around the city to spread the word about bees, urban beekeeping, and honey. Events at Bartram's Gardens, Wyck Historic House, and the Wagner Free Institute of Science range from the Honey Happy Hour to beekeeping lectures to the Be A Bee pageant. Watch the recently released, award winning documentary "More Than Honey". A full schedule of events will be out in the coming weeks, so keep an eye on the festival website at phillyhoneyfest.com and save the dates! Sarah E Adams is an editorial intern at Grid and can also be found working for Bennett Compost at a farmers market near you.